Have you been to Morrisons lately? I was in my local Morrisons the other day. I was probably buying milk. I always seem to be buying milk. Anyway, my local Morrisons has recently installed some swanky new self-service checkouts. You know, those horrible checkouts where a tinny, robotic voice bleats at you to scan your items, and then promptly goes wrong, forcing you to stand around waiting for an assistant to come and reset the system. So, I was waiting in line, and the elderly woman in front of me was scanning her shopping, when suddenly the robotic voice announced, incredibly loudly, "Surprising item in the bagging area." I'm sure they used to say, "Unexpected item in the bagging area." I guess that sounded too accusatory. What were you thinking, Morrisons? I mean, I don't care what you are trying to scan at the time, "Surprising item in the bagging area," is an unusual choice of words. But in this particular instance, the woman was trying to purchase a cucumber. So, I'm there, watching an increasingly red-faced elderly woman jabbing a cucumber at an automated checkout while it repeatedly, and incredibly loudly, intones, "Surprising item in the bagging area." I am laughing so hard, tears are rolling down my face. Mainly, this is because I have a warped and childish sense of humour. But also, I'm laughing because little things amuse me. Maybe that's why I like Mr. Jack: The Carriage, probably the smallest, and indeed most surprising, board game expansion I own. 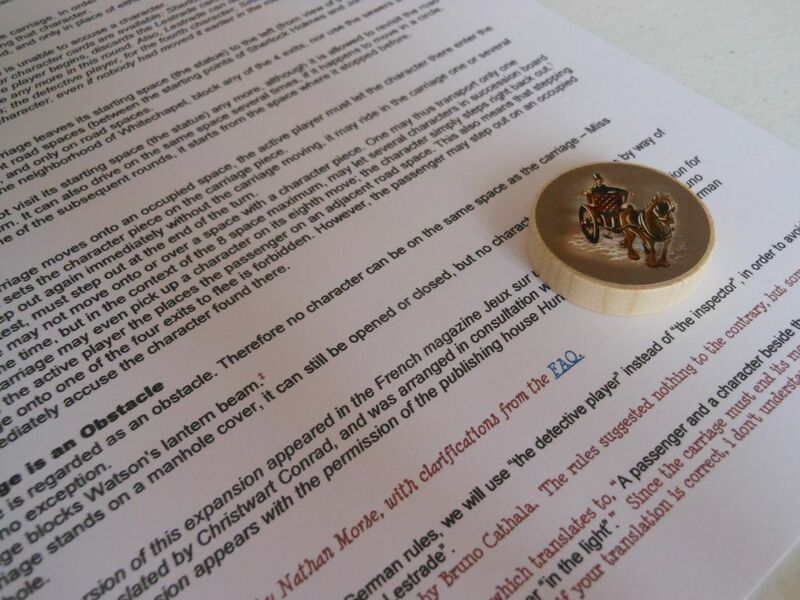 It comprises a single playing piece: A wooden disc, with a sticker of a carriage on it. Well... There are some rules for using it. But basically, it's a single wooden disc. So, is that it? That's everything? 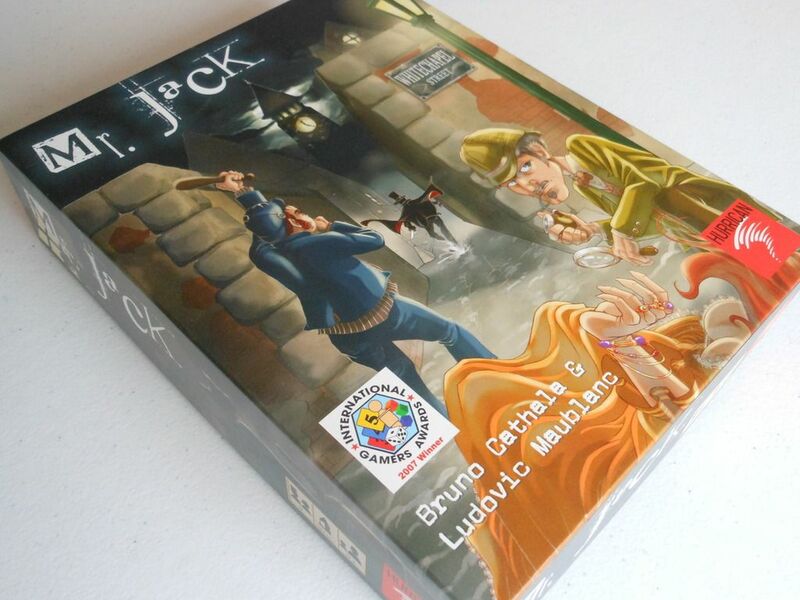 It came as an insert with spielbox magazine, and it is a surprisingly decent addition to the Mr. Jack experience. At the start of the game, the carriage piece is on the central statue space. On any turn (and only once in each round), one of the players has the option to pick a character card to activate, but then activate the carriage instead. That means, the player does not get the ability of the activated character, and does not get to directly move that character. Instead, the player moves the carriage. The carriage moves up to eight spaces, only on the streets, and as it travels it has the ability to pick up characters and move them around. It is possible to move several characters in a turn, but only one character is allowed in the carriage at a time. I guess it must be a minicab. When characters disembark, they are allowed to move into any adjacent street space. As anyone who has played Mr. Jack should be able to tell, controlling the carriage is very powerful. It enables a player to move a character huge distances, but more importantly, it enables a player to move several characters in a single turn, unceremoniously dumping them next to lampposts or other characters. Better yet, it is possible for a character to disembark the carriage onto a space containing another character in order to make an accusation. This completely turns the original game of Mr. Jack on its head, and I guess for some people, that's not a good thing. Anyone who enjoys the purity of the original challenge is going to balk at the way the carriage allows you to increase the movement of characters, move several characters at once, or even make an accusation using a character who's character card was not even available on that round. Once the carriage is on the table, it becomes the focus. Controlling the carriage is vital to controlling the board; and knowing how to use the carriage in the most efficient way possible is key to success. Even parking the carriage is thought-provoking, as it becomes a barricade that blocks movement and line of sight. And when you aren't in control of the carriage, you are desperately trying to position characters so they block the carriage's movement (if the carriage has an occupant, it is not allowed to move through a space with another character), or else get away from the damned thing. But sometimes you will really want to use a character's ability as well, and that creates a tough decision point: Do you want that freedom of movement, or do you want to ensure you take control of your prime suspect for the round? Do you want to control a character to use his special ability, knowing that your opponent will then have the option of moving the carriage? But... It's not quite Mr. Jack. I enjoy using the expansion. But not all the time. And to be honest, I get to play Mr. Jack so infrequently these days, I generally just end up playing the base game, and the carriage stays in the box. Still, it's nice to have the expansion in my collection. It is a unique, clever, addition to the game. And surprising too. Possibly even more surprising than a cucumber stuck in your bagging area. In my experience, people who DON'T have a warped and twisted sense of humour tend to be rather dull. Just picked up a copy of this expansion online and it didn't come with the rulebook! I was wondering if you could scan and share your rules that you've got so that I can print them out and put them in the box. It's not a problem when I'm there to explain, but I like to loan games/I'm not always there for explanation! If you'd rather not post but would be willing to PM them to me, I can contact you via e-mail.